As always, a great post!! Thanks for the tip. 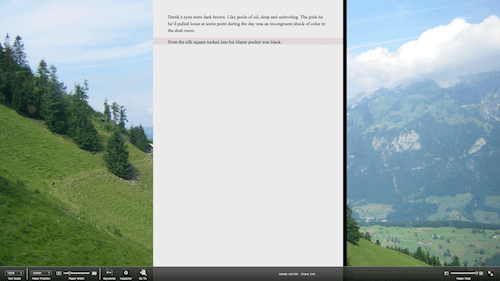 I couldn’t find the option for changing the paper color, thinking it was with the other Full Screen settings. Sure thing, JP. That’s a confusing one. Thanks for stopping by! 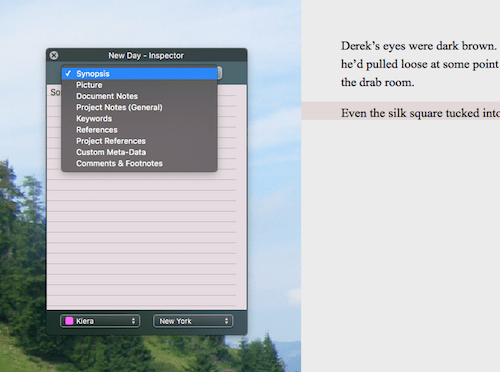 Hi Gwen, just got your book Scrivener for Dummies. Very helpful! However, I’m on a PC, and some of the instructions don’t line up. Help? 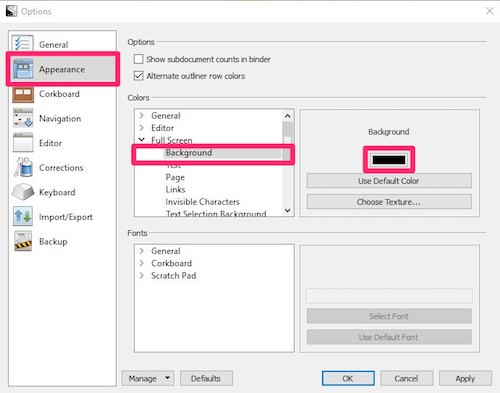 Here’s where I’m at — I’m trying to customize and add a picture to the “backdrop” in Full Screen mode, but the directions call for menus and lists not visible on the Windows version. I’ve tried exiting Full Screen mode and hitting “tools: options: full screen,” but again, the menu doesn’t list anything about pictures. Is there a way to change the backdrop in Full Screen mode for Windows? Thanks! Annie: The image backdrop capability is not yet available in Windows. For now you can only change the color. Thanks for the response, Gwen! Isn’t evolving software fun? Either way, your book has been immeasurably helpful! dougmorse: Not that I know of. 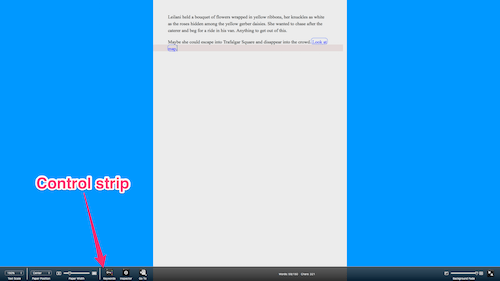 The closest thing would be to hide your Binder and Inspector, and maybe enter your OS full screen mode if you have it. Gwen, I believe that I followed your instruction on changes the background color and paper color. I wanted to type on blue paper, but when I make the color changes, even though, customizable colors changed to the blue I chose, my page remain white. What did I miss. (ps, I am trying to decide between the paper version and the electronic version of your book. 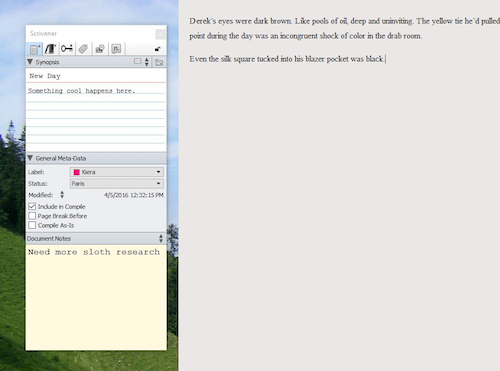 I like the idea of having the electronic version available while I am working in Scrivener, but with Kindle Paperwhite, the lack of page numbers can be a pain). Never mind my last post, when I switched to composition mode, my colors were there. Asher: Glad you figured it out. As far as the electronic vs. paper version of my book, the one complaint I’ve heard about the e-version is that the screen shots can be hard to see. But then it’s more convenient to take with you, and easy to search. So, I’m probably no help. 😉 Either way, I hope you find it helpful! I fixed it! I had to uninstall it and then install it again! I guess I wont update it unless I have to! 🙂 Have a great weekend!! Hi, Mimi! Actually, that’s probably due to the size of your image and how you added it. If you go through the Textures button in Preferences, the image will “tile” or repeat itself to fill the screen. 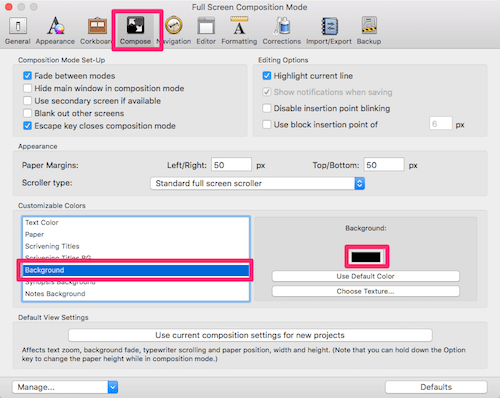 If you use View–>Composition/Full Screen Backdrop to set an image just for that project, it will scale up or down to fill the screen. HTH!